The Louvin Brothers - Joy to the World! What Difference Has Jesus Made In History? Above: an old embroidered place setting from my own collection, showing Ulster as a combination of Thistle, Rose and Shamrock. Probably circa 1930. I still have trouble explaining - often to people who really should know better - that the political 'two tribes' Troubles industry is not the only way to view life and history of Ulster and Northern Ireland. Perhaps the Troubles industry is too lucrative, too much of an easy-sell, for those who have grown wealthy, famous or even lazy by perpetuating it. It fills airtime and column inches, it sells books and theatre tickets, keeps people in certain jobs, and consequently fills people's hearts and heads. Politics has its place, but it should not be everything. I will continue to argue for the cultural three strands story. On Christmas Day I was loaned a book (now that's miserly, eh?!) entitled The Orange Order, written by a Tony Gray, published in London in 1972. I have not started to read it yet, but the short author's bio on the verso caught my eye. It gives some of Gray's background, mentioning that '... his mother comes from an Ulster family of Scots-Irish settlers called McKee, his father was Anglo-Norman in origin and Church of Ireland by persuasion; and he married an Irish Catholic. So, as he says, he has been exposed to three of the main strains in the Irish situation ...'. Thistle, Rose & Shamrock. Scottish, English & Irish. Presbyterian, Anglican & Catholic. Three cultural sides to the story, not two. Thanks to the many thousands of you who bother to visit and read here throughout the year. I plan to be offline for a few days, so enjoy your New Year / Hogmanay celebrations and I'll be back in early 2013 (dv) with the same themes and some new thoughts and discoveries along the way. Thanks to Robin for sending me the Burns animation below. The same people produced the one about St Andrew. Our distinctive stories could also be treated with this kind of simplicity and creativity. Both are from AboutScotland. 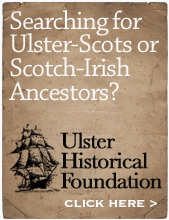 Spending time with folk and talking with them always makes great oul Ulster-Scots & Scots vocabulary rise to the surface. My mother has been wracked by deteriorating health for many years now; she was talking this evening about pains in her legs and described them as 'stoons'. • James Fenton's The Hamely Tongue has 'stoon' as 'a sudden sharp spasm of pain'. 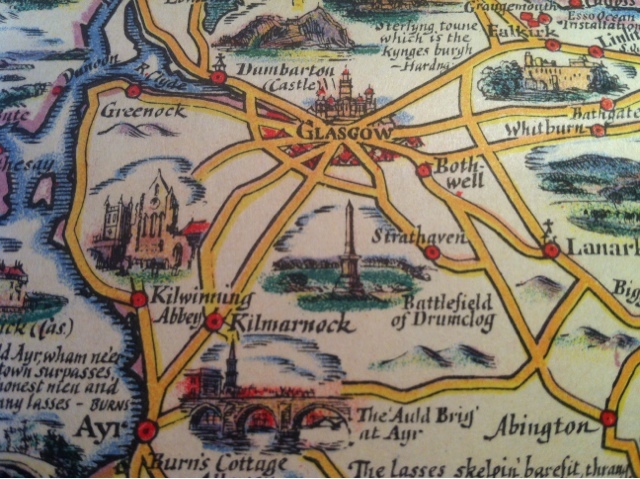 • The Chambers Scots Dictionary has the words 'stound', 'stoun' and 'stund' meaning 'to ache, throb', 'an intermittent throbbing pain' and 'a sharp, sudden pang'. With the site of the Covenanters' victorious Battle of Drumclog of 1679 marked. Wikipedia entry here. This is the hardest way to shoot a film - a single shot with no editing capturing a raw, live performance. Looks great, and the music is pretty good too. Have only watched / listened to it once, I suspect it'll grow on me. 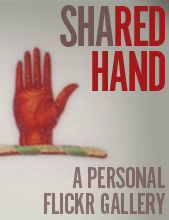 Website here. I am often reminded by my more traditionalist friends that Christmas wasn't a public holiday in Scotland for many centuries, an attitude which was carried across the water to Ulster and which continued well into my parents' generation - and remains in some quarters today. Some of the opposition to Christmas (such as the over-indulgence and twee sentimentalisation of the Christmas story) is perfectly valid, and there are sound theological objections as well. But I suspect it's also just an opportunity for miserable graceless killjoys to feel superior to other folk who enjoy the celebrations at the darkest time of the winter. THIS is the season of the year when, whether we wish it or not, we are compelled to think of the birth of Christ. I hold it to be one of the greatest absurdities under heaven to think that there is any religion in keeping Christmas-day. There are no probabilities whatever that our Saviour Jesus Christ was born on that day and the observance of it is purely of Popish origin; doubtless those who are Catholics have a right to hallow it, but I do not see how consistent Protestants can account it in the least sacred. However, I wish there were ten or a dozen Christmas-days in the year; for there is work enough in the world, and a little more rest would not hurt labouring people. Christmas-day is really a boon to us, particularly as it enables us to assemble round the family hearth and meet our friends once more. Still, although we do not fall exactly in the track of other people, I see no harm in thinking of the incarnation and birth of the Lord Jesus. Observe, this morning, the sacred joy of Mary that you may imitate it. This is a season when all men expect us to be joyous. We compliment each other with the desire that we may have a "Merry Christmas." Some Christians who are a little squeamish, do not like the word "merry." It is a right good old Saxon word, having the joy of childhood and the mirth of manhood in it, it brings before one's mind the old song of the waits, and the midnight peal of bells, the holly and the blazing log. I love it for its place in that most tender of all parables, where it is written, that, when the long-lost prodigal returned to his father safe and sound, "They began to be merry." This is the season when we are expected to be happy; and my heart's desire is, that in the highest and best sense, you who are believers may be "merry." Mary's heart was merry within her; but here was the mark of her joy, it was all holy merriment, it was every drop of it sacred mirth. It was not such merriment as worldlings will revel in to-day and to-morrow, but such merriment as the angels have around the throne, where they sing, "Glory to God in the highest," while we sing "On earth peace, goodwill towards men." Such merry hearts have a continual feast. I want you, ye children of the bride-chamber, to possess to-day and to-morrow, yea, all your days, the high and consecrated bliss of Mary, that you may not only read her words, but use them for yourselves, ever experiencing their meaning: "My soul doth magnify the Lord, and my spirit hath rejoiced in God my Savior." Finally, someone sent me this quote several years ago. It certainly sounds like Spurgeon, but I have not been able to document it. If you know where it comes from, please let me know. Whether he said it or not, it expresses the sentiments of my own heart very well. "Religion never was designed to make your pleasures less." • performance of the Scottish folk song here, sung in Scots. TONY LADESICH'S FILM “Two Sisters” may have found its perfect home. His award-winning 12-minute movie will be the centerpiece of the fourth annual Murder Ballad Ball, an evening of music that honors songs about love and homicide. “Two Sisters” has been screened twice in Kansas City and once in Lawrence. “I really don’t think it has had a real, proper coming-out showing in Kansas City yet,” Ladesich said. Saturday’s showing could be its grandest yet. It also turned out to be a catalyst. For years, Ladesich had been contemplating the idea of making some kind of film about the murder ballad tradition. It was prompted by the cultural uproar that followed release of the Eminem song “Kim,” in which he kills his wife. He wrote a couple of original verses to the song, added some verses from older versions and made the couple married (they aren’t in the Welch version). He then went looking for cast members, but not in the usual places. “I wanted all actors to be musicians first and actors second,” he said. His cast comprises Mark Smeltzer, Richard Alwyn, Kasey Rausch and Erin McGrane. Off-camera he also enlisted singer/songwriter Mikal Shapiro as an executive producer. Fiddler Betse Ellis, formerly of the Wilders, is part of the film’s score. Saturday will also be a coming-out of sorts for Ladesich, who is also a musician and songwriter. For the fourth year in a row, he will perform at the ball. This time he will feature his new band, the Secret Liquor Cure with Ben Ruth (bass), Kyle Dahlquist (accordion and pedal-steel guitar) and Sam Platt (drums). Ladesich has been in a few local bands, including Sandoval, Pendergast and Faster Horses. Several years ago, he withdrew from the music scene to focus on filmmaking and videography. All the musicians in the film will perform at the ball. So will Ellis and Shapiro. This year’s performance represents a revival of sorts for Ladesich. Article by Charles Culbertson, published in the Staunton News Leader, Staunton, Virginia. One of the questions I’m most frequently asked regarding Staunton history concerns the city’s twin peaks of Betsy Bell and Mary Gray, the imposing and once unspoiled landmarks named after two young Scottish lasses. No other aspect of Staunton’s history — with the possible exception of the pronunciation of the word Staunton itself — is so fraught with misinformation and conjecture. The tale I’ve heard most often is that the mountains are named after two local girls who were captured and killed by Indians. How it got started, no one knows, but this persistent fable has been around at least since the early 1830s when a Northern periodical printed a detailed account of the alleged tragedy. The author claimed to have gotten the story — which is utterly fictitious — from an old man sitting by the road in the shadow of the hills. The truth behind Betsy (originally Bessie) Bell and Mary Gray can be found in Scotland in 1666, when two young girls seeking to avoid a plague fled to the Highlands. A young man in love with them both visited often, carrying supplies to the bower they had built. Unfortunately, he carried the plague with him and unconsciously gave it to Bessie Bell and Mary Gray. The lasses sickened, died and were buried near Perth. Their death gave rise to a ballad, which traveled to Ireland with Scotch immigrants. These immigrants named two hills in the county of Tyrone after the girls (MT: I think this is near Newtownstewart); historians generally believe that Scotch-Irish settlers to Staunton saw a resemblance between the Irish mountains and ours, and bestowed the names on our twin peaks, as well. As an interesting side note, two adjacent volcanic cones in New Zealand were also named Bessie Bell and Mary Gray by European settlers in the 19th century. The name “Bessie” had changed to “Betsy” by the time of the Civil War, which saw the trees on its crest cut down for a Confederate observation post. Staunton historian Joseph Waddell once noted that Stauntonians could see smoke from the battle of Piedmont from this viewpoint. Catlett also required that the city cut the shape of a cross out of the woods near the crest. Both requirements are honored to this day. • Nelson McCausland's blog has this interesting posting about the story including the words of the ballad. • Here is a recent story about efforts to restore the burial site. 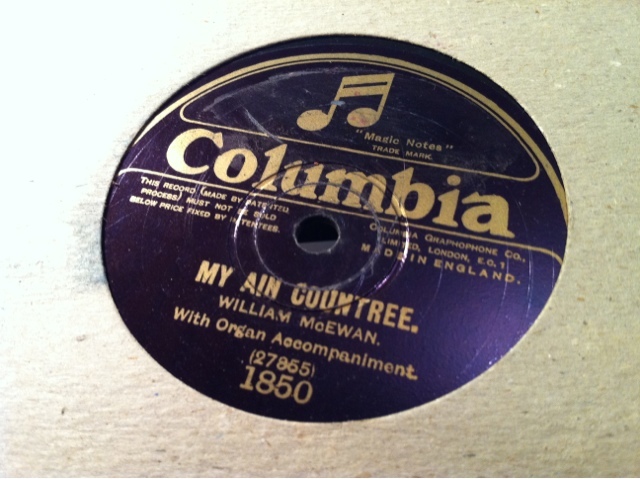 My grandfathers favourite song. Finally located an original 78. 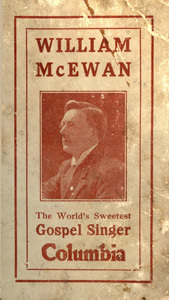 One of 24 pieces recorded by McEwan in London, November 1911 - the first ever gospel recordings in the world.